In June of this year Metro officially released transit route and schedule data to the public via the Metro developer site (http://developer.metro.net). The announcement brought about some excited chatter on local blogs, mostly in anticipation for Google Transit, but after the Google launch in July it seemed like the Metro developer site was quickly forgotten. While Google Transit is a great application (and a long awaited one) there’s still much that can be done with Metro’s transit data. Applications for the ubiquitous iPhone are just one example. San Francisco has a bunch of iPhone apps for transit users. So does Portland. These apps were not created by their respective agencies, but by independent developers with a passion for transit and access to their local transit data. It’s time for L.A. to join the fray. That’s not to say L.A. transit riders with iPhones are left with nothing. There’s two apps out right now, iTrans and iTransitBuddy that attempt to fill the void. iTrans covers timetables for the Metro rail system, with the Orange Line busway included. The icon for the app that appears on the iPhone is easy to recognize — it’s the front of a train. The app offers a map of the rail system and users can tap on a station to find out when the next train or bus is departing. It works well — it’s certainly better than trying to download Metro’s timetables in a pdf format — but there’s an extra step involved in getting arrival times at another station. Unfortunately, Metro’s massive bus system isn’t included. iTransitBuddy is also limited to just Metro rail and has a much less intuitive and attractive interface than iTrans. The problem with both these apps is that they are created by East Coast developers who have access to the data but don’t seem to have first hand experience with the system. There’s similar versions of each app for various cities where the transit data is simply replicated. Currently, L.A. has nothing like Portland’s PDX Bus which was created by a Portland-based developer who uses TriMet on a daily basis. Consider this post an informal introduction to the Metro developer site and a call to all those talented developers and creative types who are passionate about L.A. transit to put this data to good use. One idea — surely there’s a clever app waiting to be created for the Metro Rapid bus system. The rapidbus.net website was designed to work on cell phones and does, in fact, work well enough. But it would sure be nice to see some other approaches to getting bus information out there, particularly now that many cell phones are equipped with GPS. This data is provided as a web service – in other words the data is published by Metro, and developers with an API key (provided by Metro) can call data to be used in their application(s) and website(s). Currently developers can query the following data: carriers (the various transit agencies in the region), routes, stops and schedules. In the future the following data will be provided: proximity, walking distance, fare, service advisories and more. As you can imagine, in the hands of savvy developers, access to all this data could lead to very powerful trip planners, customized for unique needs. The GTFS feed is an open format created by Google for providing transit scheduling and geographic information for use in Google Transit. Basically, it’s way of formatting all the data from Metro (including routes, stops, and schedules) that Google Transit uses. What’s cool is that Google encourages use of the feed for other applications beyond Google Transit. The GIS feed data, called shapefiles, provides precise geographic information for all Metro bus routes, bus stops, rail lines and rail stations. Essentially, it allows developers to accurately create a map of the Metro system in their applications. GIS files require special mapping software. Not only does the Metro developer site provide mounds of transit data, it also provides the online framework for a community of developers to come together and share ideas, tips, and communicate with Metro staff responsible for the data. If you’re interested in participating you can become a member so you can start interacting with Metro staff and the other members of the site. The developer blog is where most of this interaction takes place. On the blog Metro staff and registered members can create posts and comment on other posts to share information and progress on applications. That’s right, you don’t have to be Metro staff to write a blog post on the site. There haven’t been any new posts on the developer blog since July. Hopefully this post will jumpstart things over there and get the ball rolling on some great new apps for the new year. The data is there developers, Metro just needs your participation. Do you think Metro should hold a contest to encourage developers to participate? Anaheim is doing it, and so is New York City. In fact, competitions to find great uses of public data are becoming a nation-wide phenomenon. 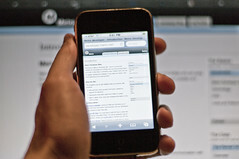 Shoot us an email at thesource@metro.net if you’d participate in a Metro app contest.